I enjoy a little serendipity in the kitchen. Those occasions when an accident turns into a wonderful new creation for example. This pudding came about by accident a few weeks ago when friends came over for Sunday lunch. I intended to make an impressive pavlova but managed to crack the meringue and I was forced to improvise. The broken pieces of meringue, along with the spiced, stewed fruits, were gently folded into whipped cream for a winter version of an Eton mess. I’ve made it again since – the second time I took photographs for the blog. Instead of folding the ingredients together, I layered them in cocktail glasses for a slightly prettier and more refined dessert. I like bold flavours and so the plums and apples are quite heavily spiced with star anise, cinnamon and ginger. If you’re not so fond of strong spices, you may wish to hold back a little. 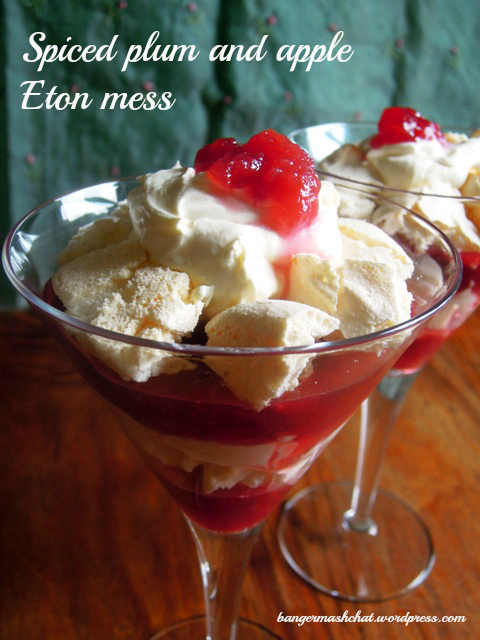 This mess would provide a fantastic finale to a festive meal, perhaps as an alternative to the traditional trifle. If you don’t have an Aga, preheat the oven to 150ºC / gas mark 2. In a large bowl, beat the egg whites and salt until stiff. Gradually whisk in the caster sugar a teaspoonful at a time, and finally whisk in the corn flour and vanilla. Lay a sheet of silicone paper on a baking tray and onto dollop small evenly-sized rounds of the mixture. If you have an Aga, put the baking tray on the floor of the roasting oven for three to four minutes, until the meringues are slightly coloured. Then move down to the floor of the simmering oven for about an hour until the meringues are firm on the outside but still a little gooey in the middle. If you’re using a conventional oven, bake for an hour and then turn the oven off. Open the door halfway and allow the meringues to cool to remove to room temperature before removing. For the stewed fruits, simply place all the ingredients in a heavy-bottomed saucepan, stir well and bring to a simmer. Cook gently for around 20 minutes, stirring now and again, and skimming off any froth that forms on the surface. When the fruit is tender and the syrup has thickened, remove from the heat and allow to cool. Pour the double cream into a large bowl and sift into the icing sugar. Whip until the cream forms soft peaks. When the fruit and meringue are completely cool, you can assemble your desserts. Break the meringues into bite-size pieces. Spoon some stewed fruit into the bottom of your bowls or glasses. Place some meringue on top and them some whipped cream. Continue until you have filled each bowl/glass. Serve chilled. This dish is spiced with cinnamon sticks and so I am entering it into this month’s Spice Trail challenge, which I just happen to be hosting. Party Food is the theme this month at Four Seasons Food, hosted by Delicieux and Eat Your Veg, and so I thought these puds would be good for a festive party. 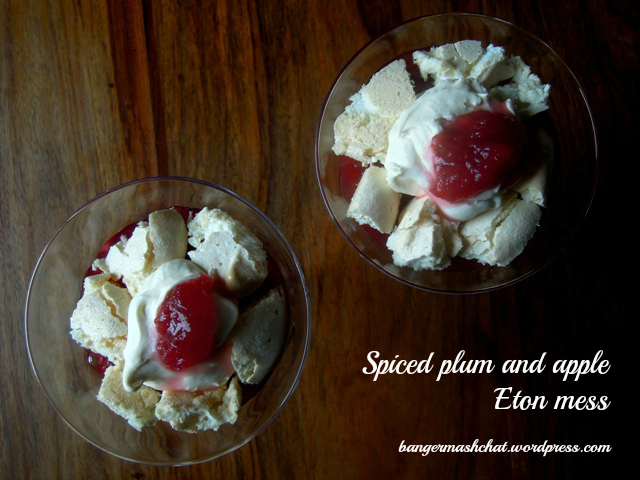 And lastly as a very British dessert meets a very Oriental spice, I thought I’d also enter this Eton mess into December’s Fabulous Fusion Food challenge hosted by Deena Kakaya. Looks fab! Some of my favourite recipes have occurred serendipitously, funny how it happens!